Greetings from Rome! Today was our second day in Rome. We are so in love with this city. Everywhere we go, we are awe-struck. Last night, after we arrived in Rome, we wasted no time, and walked all over the City taking in as much as we could. Jerry and the boys behind the Triton Fountain in Piazza Barberini, before our tour. The fountain is a 17th Century fountain. Today, our much-anticipated main event was a small group tour of the Capuchin Crypts, catacombs and ancient underground churches. 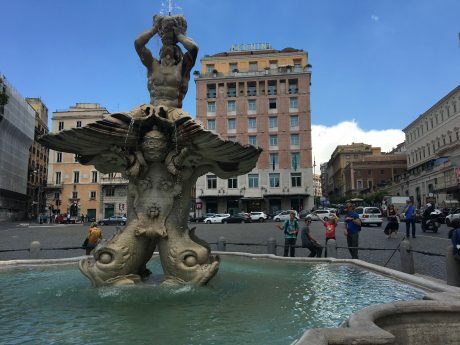 We didn’t have to meet the tour guide until 1:45pm, so this morning we walked all over Rome, to several piazzas, including Piazza Napoleone, Piazza Novona, Piazza DiSpagna and the Spanish Steps, Piazza Del Popolo, Piazza Barberini and Piazza Venezia. We also went to the Vittoriano, Borghese Park and by the Colosseum. We didn’t spend much time at the latter because we have a small group tour that will include the Colosseum, the Roman Forum and the Underground and Arena in a couple of days. A few months back, we signed up for the 3.5-hour “Skip the Line: Crypts and Roman Catacombs Small-Group Walking Tour,”and what a brilliant move that was. The tour blew us all away. We just returned to our flat after another delicious Italian dinner, and during dinner, Jerry and the boys and I could not stop talking about our experience this afternoon. Note: We were not allowed to take any photos of videos of what we saw, due to their sacred and religious nature. However, I’m including some photos I found online that I believe I’m permitted to use, because they have common use licenses and I’m linking them to their original source. I sure hope this is okay. I’m not trying to do anything illegal, but rather share some of the intriguing sights we were able to see today. First off, we had a fantastic guide. Her name is Georgia Darell, and we highly recommend her! 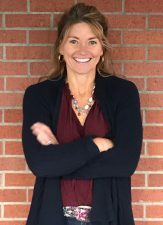 She has an encyclopedic knowledge about the Capuchin Crypts, the Catacombs, and the Basilica of San Clemente – and for all of Rome. Georgia is not only informed, but passionate and funny, too. We met Georgia, and the rest of our group, at Piazza Barberini, and then we all walked over to the Capuchin Crypt at the Church of Santa Maria della Concezione. First, we took a quick tour of the Crypt museum, home to St. Francis in Meditation, a painting by Caravaggio, as well as other artifacts about Italy’s patron saint, St. Francis. Then, we entered the Capuchin Crypt. (Photo by Wikipedia.org) One of the crypts we toured. The crypts we saw included: Crypt of the Resurrection, featuring a picture of Jesus raising Lazarus from the dead, framed by various parts of the human skeleton. Crypt of the Skulls, which was my personal favorite –probably because of what our guide shared while we viewed it. She remarked that what she likes about the Crypt of Skulls is that it reminds us that, despite the difference we all have in skin color, amount of wealth, beliefs, etc., when we die we all look similar and we’re all equal. She also pointed out one of the designs that forms a time piece with wings. 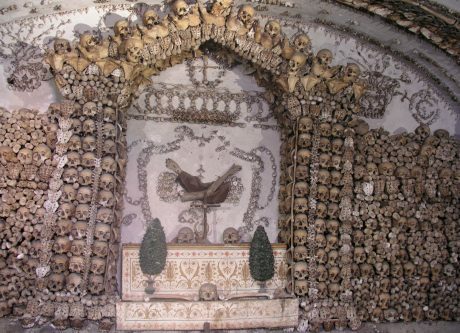 “Time flies.” She said, “so Carpe Diem.” The Mass Chapel, an area used to celebrate Mass, does not contain bones. In the altar-piece, Jesus and Mary exhort St. Felix of Cantalice, St. Francis of Assisi, and St. Anthony of Padua to free souls from Purgatory. The chapel contains a plaque with the acronym DOM, which stands for Deo optimo maximo (“To God, the best and greatest”), a term initially used to refer to the pagan god Jupiter, but claimed by later Christians. The plaque contains the actual heart of Maria Felice Peretti, the grand-niece of Pope Sixtus V, and a supporter of the Capuchin order. When she died, Peretti’s heart was donated to the monks, and her heart is in this crypt. The Crypt of the Three Skeletons is the only crypt with entire skeletons. The three full skeletons are of young children. The center skeleton is enclosed in an oval, the symbol of life coming to birth. In its right hand it holds a scythe, symbol of death which cuts down everyone, like grass in a field, while its left hand holds the scales, symbolizing the good and evil deeds weighed by God when he judges the human soul. A placard in five languages declares: “What you are now we used to be; what we are now you will be…” Powerful… The two other crypts are called Crypt of the Pelvises; Crypt of the Leg Bones and Thigh Bones. After the tour of the Capuchin Crypt, we rode a bus to our next stop: The Catacombs of Santa Priscilla. According to Georgia, about only one-third of Rome is above ground. In fact, Rome is home of some of the oldest and longest burial underground tunnels in the world – hundreds of kilometers of underground tunnels and passages where thousands of Christians were buried during the 2nd Century. We toured the catacombs and old burial sites for over an hour, and it was fascinating! The frescoes were also beautiful. One highlight was seeing the Cubiculum of the Veiled Woman. From CatacombPriscilla.com: This room is named for the picture in the semi-circle on the back wall, in which a young woman, wearing a rich purple garment and a veil on her head, lifts up her arms in prayer. On either side of her are two scenes unlike any others among all of the paintings in the various catacombs, probably episodes of her life. In the middle, the Good Shepherd is painted in the Garden of Paradise, amid peacocks and doves. Before this scene, in the arch above the door, the prophet Jonah is shown emerging from the mouth of a sea-monster, a clear expression of faith in the Resurrection. The semi-circle on the left depicts the Sacrifice of Isaac, while on the right are shown the Three Children in the fiery furnace in Babylon; both of these episodes are expressions of faith in God’s salvation, understood by the first Christians as prophecies of the salvation brought by the coming of Christ. These pictures, which are in a remarkably good state of preservation, date back to the second half of the third century. Our last stop on the tour was an amazing one – to the Basilica of Saint Clemente, which is a Roman Catholic basilica dedicated to Pope Clement I. The Basilica of San Clemente allowed us to experience history in layers, literally. The present basilica was built just before the year 1100 during the height of the Middle Ages. Then, we walked down a level to tour the remains of a 2nd century mithraeum. A mithraeum was either an adapted natural cave or cavern, or a building imitating a cave. When possible, the Mithraeum was constructed within or below an existing building, such as the Mithraeum that we got to see found beneath Basilica of San Clemente in Rome. From Atlas Obscura: The Mithraic Mysteries emerged and gained popularity throughout Rome between the 1st and 4th centuries. The cult and religious sanctuaries were open only to initiates, and their rituals secret. The central imagery is of the god Mithras slaying a bull, a motif known as “tauribolium”, found in most if not all mithraeums. 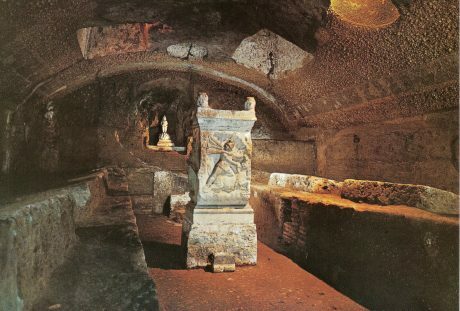 (Photo borrowed from Wikipedia.org Commons) The mithraeum, in one of the underground layers of the Basilica of San Clemente, in Rome. As if this wasn’t fascinating enough, we then went down one more level to the former home of the Roman nobleman, dating back to 64 AD. We stood on the actual floor of the 1st Century home. Like I said, we were pretty much blown away by today’s tour. The entire experience and all that we saw and discovered was unforgettable for our whole family, and will remain a highlight when we reflect on our Europe travels. 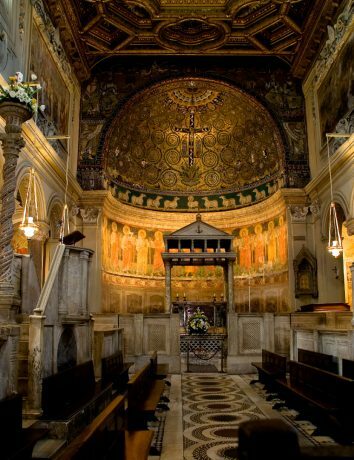 If you’re in Rome, or planning a trip here, be sure to book this tour: Skip the Line: Crypts and Roman Catacombs Small-Group Walking Tour – Rome | Viator Tour. It was an amazing day for our family. We feel blessed and privileged that we were able to see firsthand the remains of such long-ago and intriguing history. Thanks for following along with us on this Epic Adventure.